Welcome to the Center for Advanced Land Management Information Technologies (CALMIT) in the School of Natural Resources at the University of Nebraska-Lincoln. CALMIT is widely recognized for its research and education excellence in the use of remote sensing and other spatial technologies such as geographic information systems (GIS) to advance our scientific understanding and management of natural resources and agriculture. The Center was initially founded in 1972 and over a 40+ year period has produced seminal work in the scientific advancement of remote sensing to characterize crops and other vegetation types, manage water resources and investigate climate-land interactions. Collectively, this work had established a solid foundation upon which CALMIT is leveraging advanced spatial technologies and methods to harness the vast amounts of remote sensing imagery and other spatial data now available in order to better understand and respond to our changing world. CALMIT faculty and staff have remote sensing and spatial science expertise in the areas of plant productivity and stress response, drought monitoring, ecological biodiversity, soil moisture and hydrology, climate-land surface interactions and land use/land cover characterization. The Center also has expertise in spectral calibration, field data collection methods, airborne image acquisition, image processing and analysis, and GIS and remote sensing applications for environmental monitoring. The Center’s work is recognized globally with extensive research collaborations both nationally and internationally through our work with scientists at various U.S. and international universities, federal and state agencies, and other non-governmental organizations. Center faculty teach introductory and advanced spatial methods courses and routinely host visiting students and researchers to advance their technical training in remote sensing and GIS. The Center maintains state-of-the-art remote sensing research facilities to pursue work along the entire basic to applied research continuum in an effort to improve our scientific understanding of environmental processes, apply the knowledge gained and develop practical solutions to address key societal issues related to food security, water scarcity, climate variability and ecological biodiversity. These facilities included the CALMIT Spec Lab with hyperspectral remote sensing capabilities in a controlled environment, mechanized and backpack-deployed sensor systems for close-range spectral observations in the field and a Piper Saratoga airplane carrying hyperspectral, fluorescence and thermal imaging systems to acquire landscape-level imagery. The Center’s unique capacity provides research opportunities across multiple scales ranging from individual plants, plots and fields to larger regional and national landscapes. CALMIT is committed to advancing the science of remote sensing and GIS to investigate and manage natural resources and agriculture through basic and applied research, practical application solutions and technical training. I invite you to explore the CALMIT website to learn more about the Center’s work and capabilities. Extra! Extra! CALMIT top of the fold! 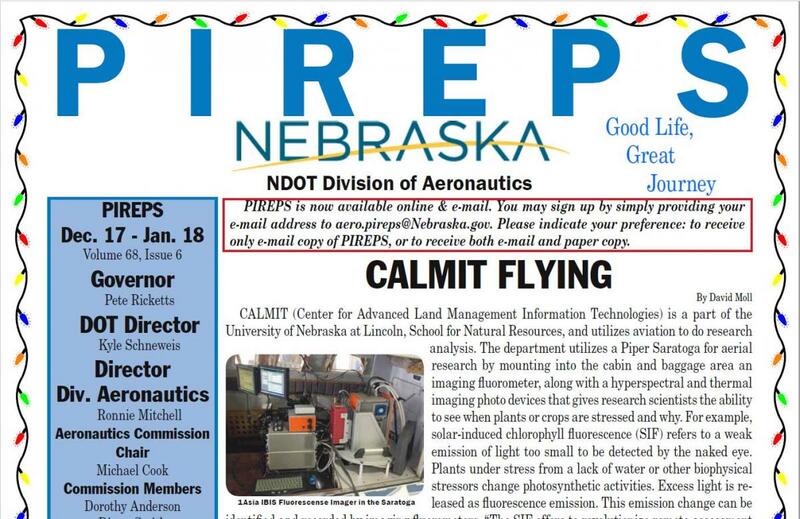 PIREPS Nebraska made CALMIT's airborne program its top story in the most recent publication. Lots of other great stories in the newsletter. Read all about it by clicking the image or the read more button below. The Center for Advanced Land Management Information Technologies (CALMIT) is a recognized center-of-excellence for education and research in advanced land management information technologies. Our state-of-the-art instruments allow us to look beyond the surface to learn more about plant productivity and response to stress.